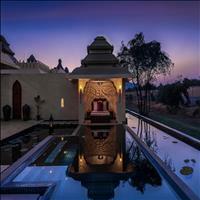 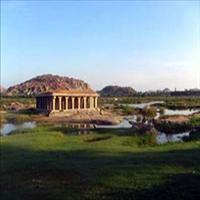 Hampi is located in the central part of the state of Karnataka, in the southern part of India. 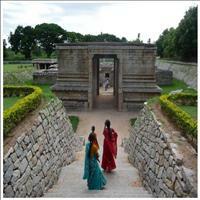 It is 353 km from Bangalore, and 13 km from Hospet. It is located on top of a rugged terrain and is 467 m above sea level. Tungabhadra River flows through Hampi. 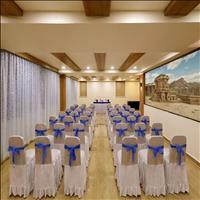 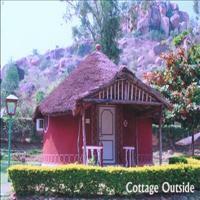 It has a tropical climate with hot summers (April-June), and cool winters (October-February). 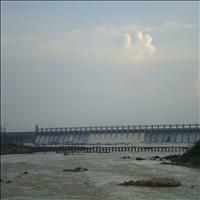 It experiences the southwestern monsoon rains from June to August. The Archaeological Museum at Kamalapuram (a small village adjoining Hampi) has a good collection of sculptures belonging to the Vijayanagar Empire. 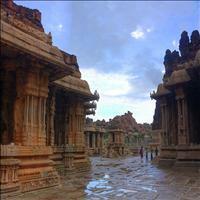 The museum is open from 10 a.m. to 5 p.m., and closed on Fridays. 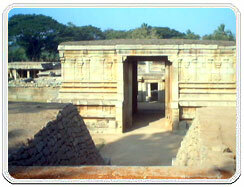 There is no entry ticket. 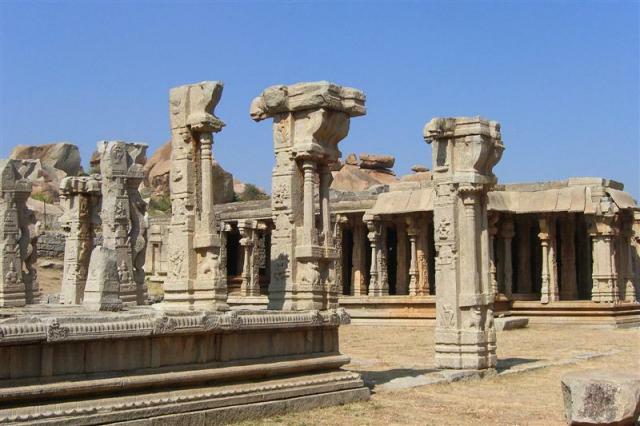 Apart from the Hampi Bazaar and the Royal Centre, Anegondi is another place worth visiting. 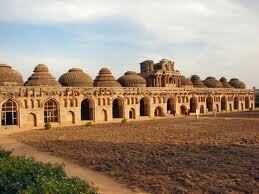 It is a fortified area north of Hampi Bazaar across the Tungabhadra River. 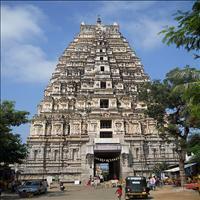 There are a number of temples in and around Anegondi. 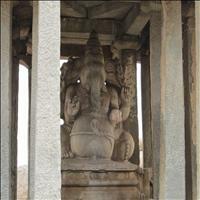 This is a 9 feet tall single stone statue, which is also known as Sasivikalu Ganesha. 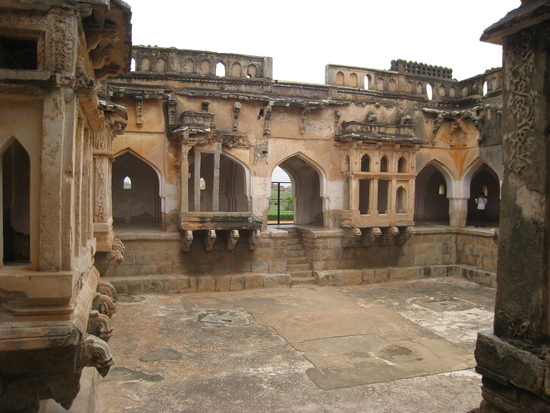 This place was recently discovered and they suspect this was for aristocrats and high-ranking officials. 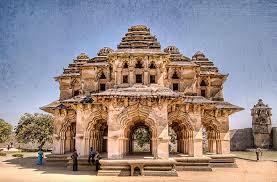 The 15th-century Virupaksha Temple is located in the Hampi Bazaar area. It is one of the oldest monuments of the town. 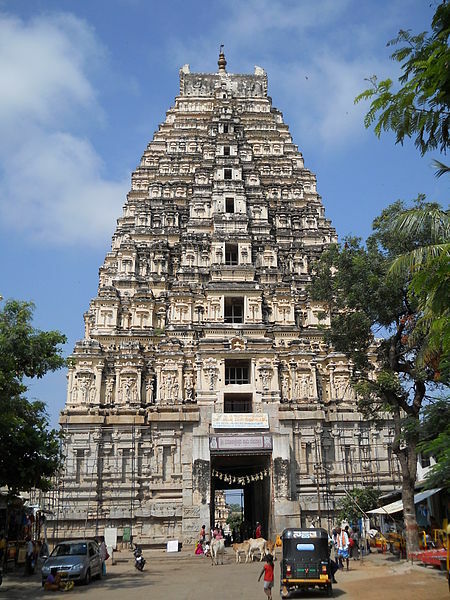 The top of the temple rises about 50 m from the ground and the main shrine is dedicated to Virupaksha, a form of Lord Shiva. 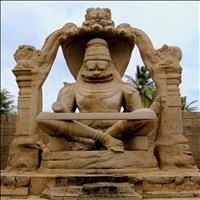 \r\nThe Virupaksha is also called the Pampapati. 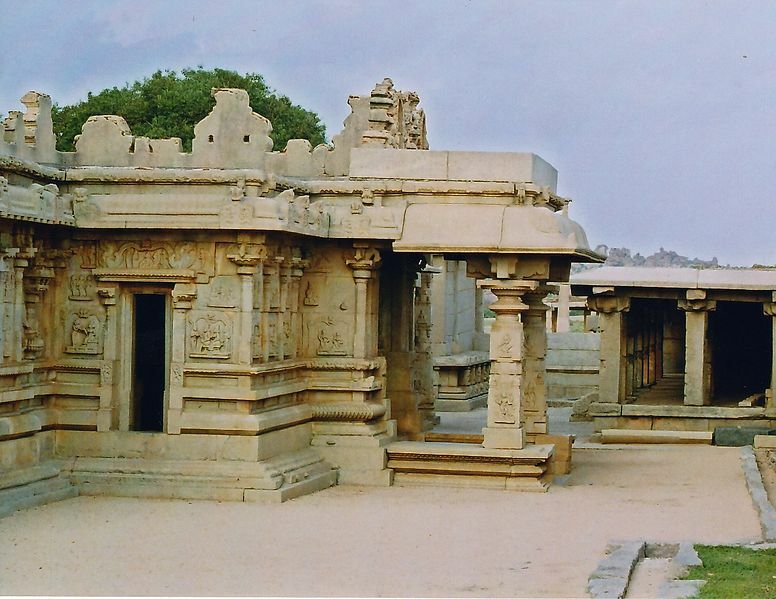 While the construction belongs to the later Vijayanagar period, there are many shrines inside the temple that are much older. 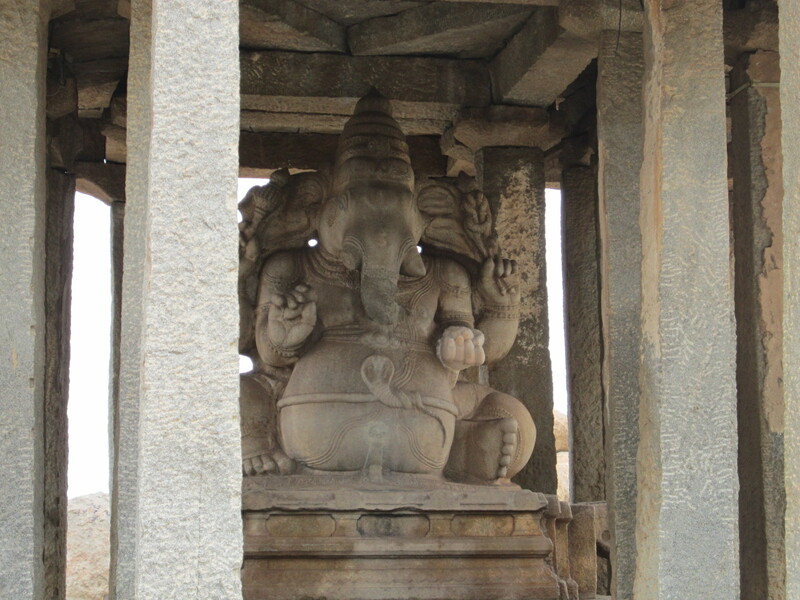 At the eastern end, there is the large Nandi in stone; on the southern side is the larger-than-life Ganesha. 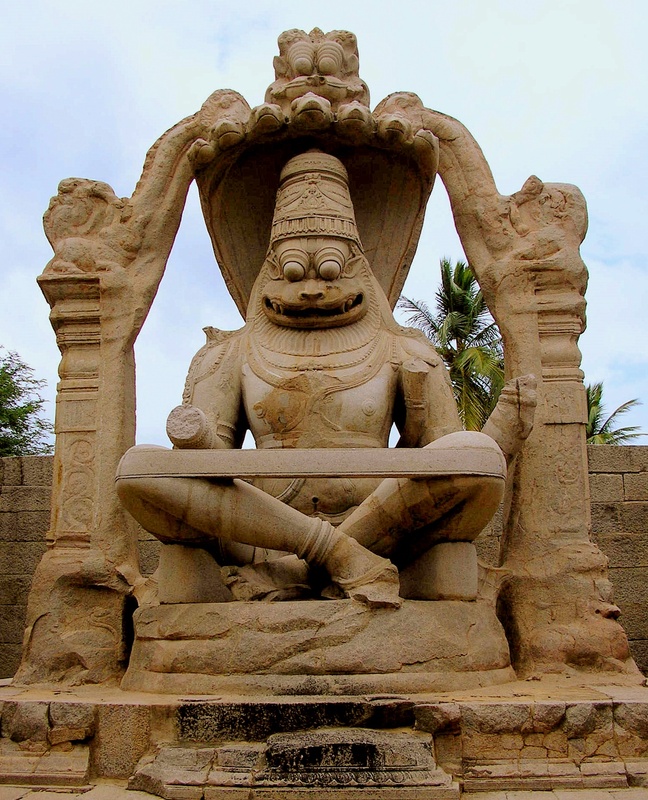 Large single stone carvings seem to have been the fashion of the day in Hampi, for there is a large image of Narasimha (6.7 m high), the half-lion half-man incarnation of God, as well as a huge linga. 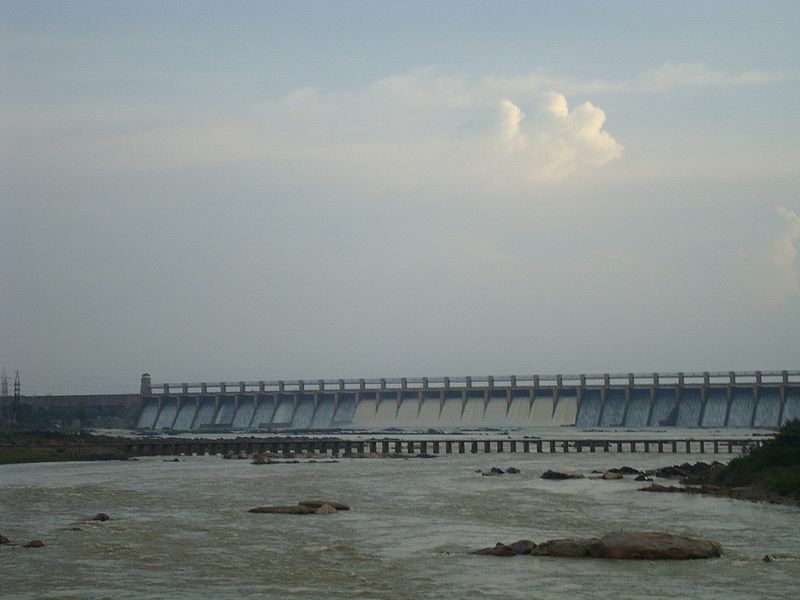 This phallic symbol now has its base in water. Two kilometers east of Hampi Bazaar, the traveller can see the Vittal Temple, built in the 16th century, and now a World Heritage monument. 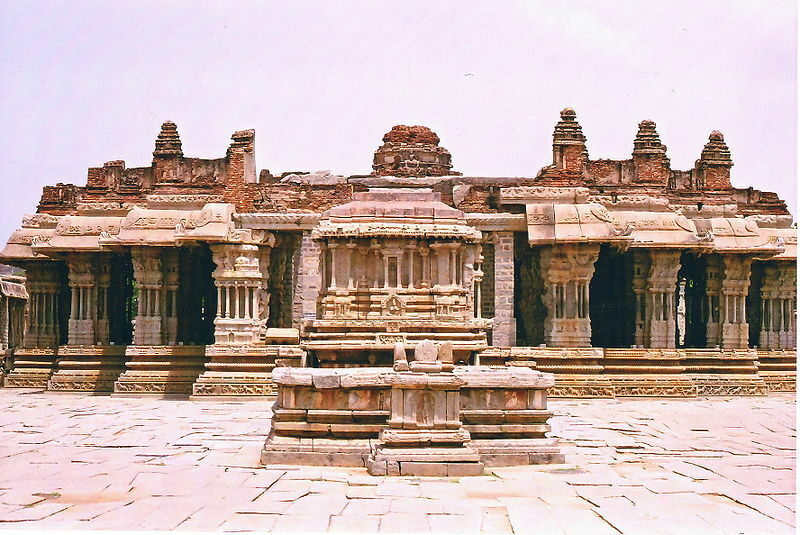 The carvings on this temple give an insight into the architectural splendour achieved by the artisans of Vijayanagar Empire. 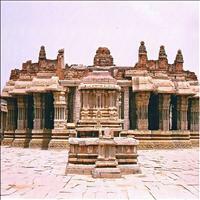 In the Vittal Temple, the columns are so balanced that they have a musical quality. 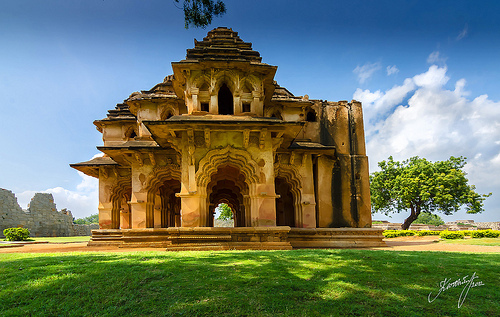 The Hazara Rama Temple was perhaps the king's private shrine and contains some exceptional carvings and murals both within and on the outer walls. The outer friezes show horses, elephants, dancing girls and infantry in procession, while the inner panels depict individual deities or scenes from the Ramayana. 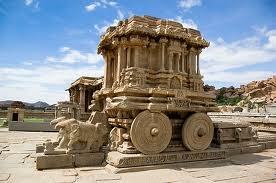 There is a garuda (hawk-like bird) with multiple wings, which is the most striking of them all. The Underground Virupaksha temple, built in 1442, is another important place to visit within the royal center. 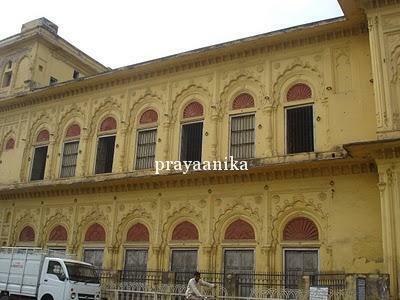 It is one of the earliest structures in the city. 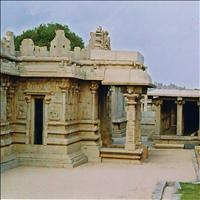 The temple is devoted to Lord Virupaksha, a form of Shiva. 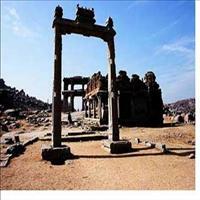 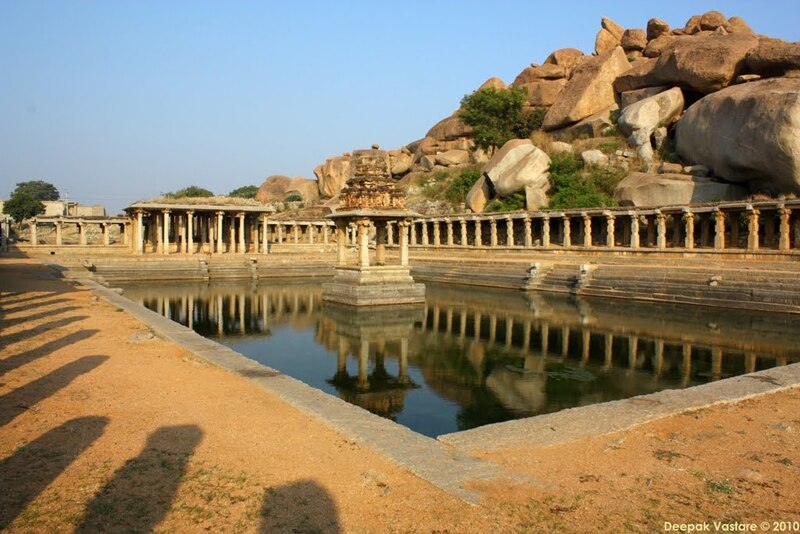 Hampi ( a.k.a Humpi or Hampe ) is both a historic & relegious place in India. 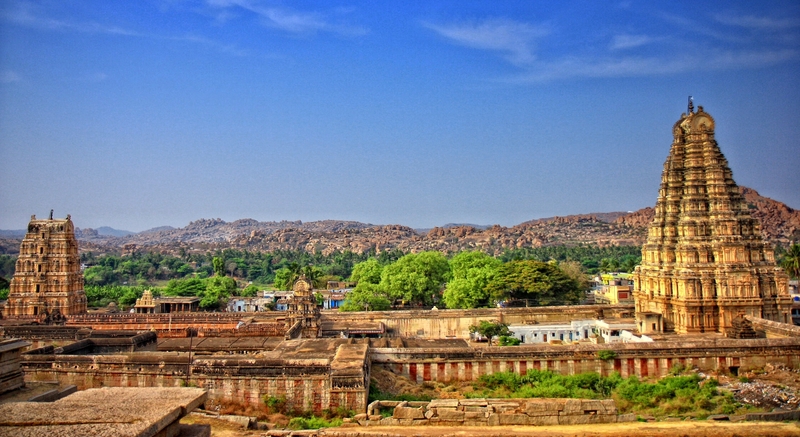 This was the capital of the Hindu empire,Vijayanagara, who ruled the south India during 14th to 16th century AD.The ruins of Hampi, as it is known today, is a vast open museum of history, architecture and religion .Spread over an area more than 25 square kilometers (10 square miles), Hampi ruins is packed with giant temples, palaces, market streets, aquatic structures , fortifications and an abundance of other ancient monuments.